Astrogeographical position of Moscow for morphogenetic field level 1 which describes the supraregional and international resonance of the capital and government of Russia: the astrogeographic position of the Moscow Kremlin and the government of “Mother Russia” falls on the second degree of solid fixed earth sign earth sign Taurus and between 11° and 12° of emotional water sign Cancer. The combination brings two female signs and aspects of motherhood together: Cancer the sign of pregnancy, conception, the uterus and ancestors plus Taurus the sign of the earth mother and the land itself. Taurus represents the sign of conquering territory, possession of land, market places and financial profits. In the case of Moscow the astrogeographical position stands for the role of the Russian Capital as the center of the largest territory possessed by one capital worldwide. 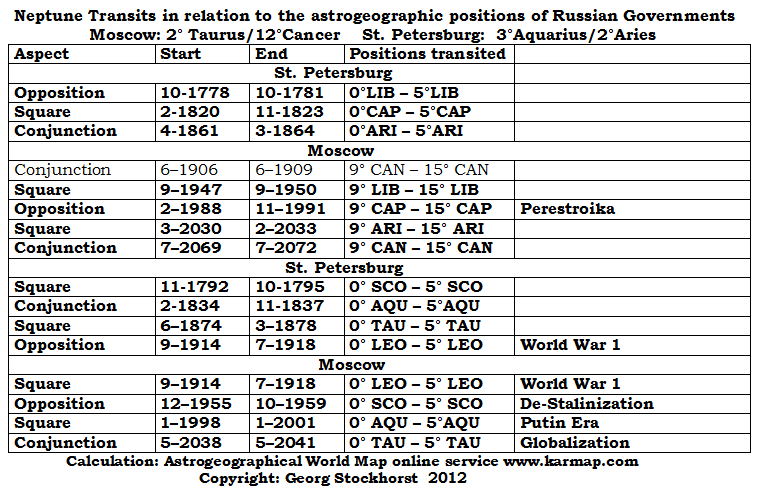 The position at 12° Cancer falls in conjunction with the positions of Berlin at 10° and Washington at 6° Cancer. Madrid located at 20° Cancer is 8° “behind” in the timing of transits. The conjunction with Washington can be evaluated as an extremely important and stabilizing factor which might have prevented much worse controversies since the beginning of the Cold War between US capitalism and Russia in 1917. 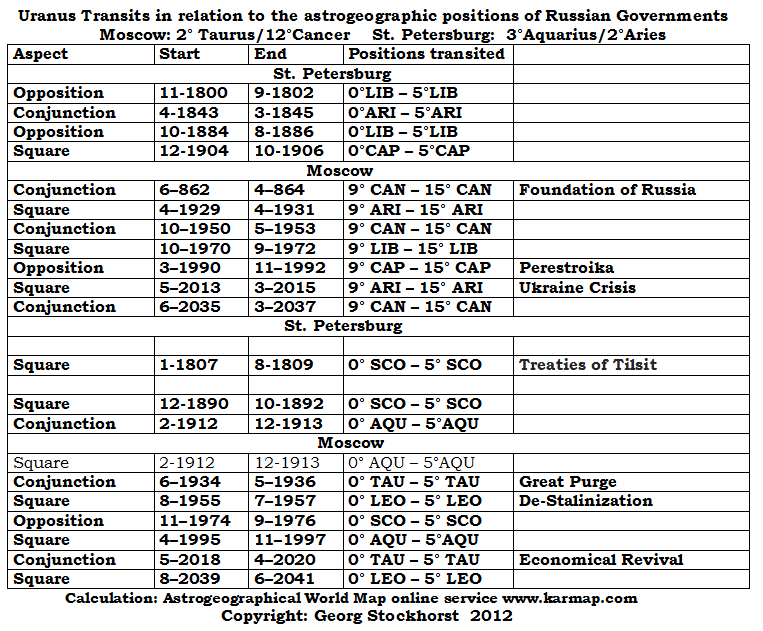 As far as the transits of the outer planets are concerned their effects regularly stimulate the position of the US capital between 1 and 4 years before transiting the maximum of any aspects with the capital of Russia. But for the “inner” planets the time in between the maximum effect of transits for Washington and Moscow is only 6 days for the Sun, Venus and Mercury and only 12 hours for the Moon. The position of Berlin in between the positions of Moscow and Washington explains the role of Berlin as a bridge in between the governments of the 2 military superpowers. 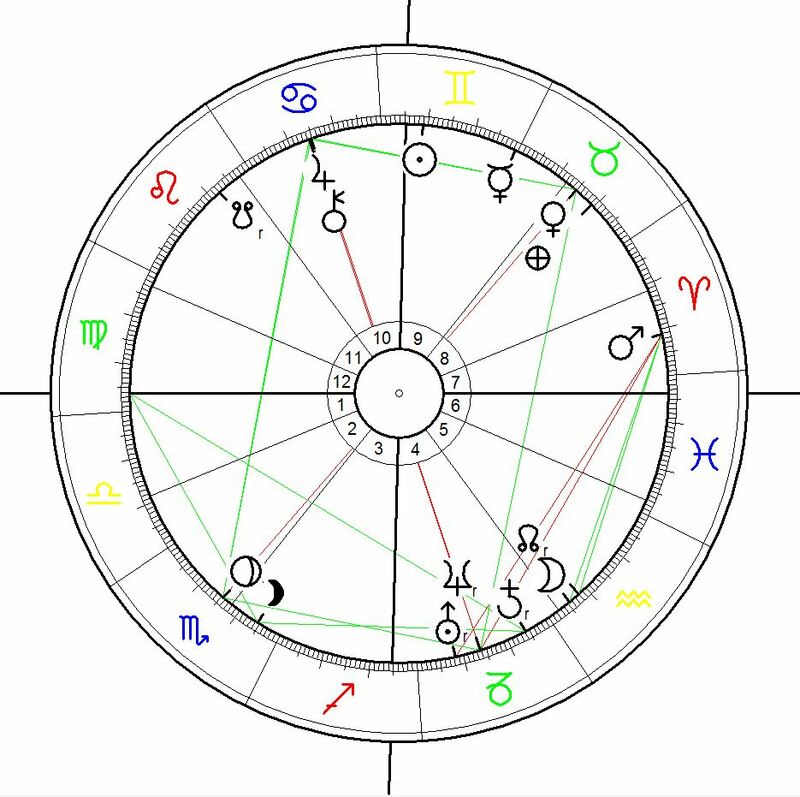 After the extremely problematic transits of Uranus and Pluto that put the Cancer position of Moscow under pressure from an opposite position (Pluto in Capricorn Jan 2013 – Jan 2016) and from a square (Uranus in Aries May 2013 – Jan 2015) their transits between January 2015 and at least until the change brought about by Uranus` entry into Taurus in May 2018 seem comparatively relaxing for the situation of the russian government. Both Pluto and Uranus are moving away from the dramatically tense position they had taken between 2013 and 2015. These movements are to be seen as stabilizing transits for the future situation of Russian economy and politics which had been under heavy pressure in the process that began with the Euromaidan Uprising in Kiew in December 2013. 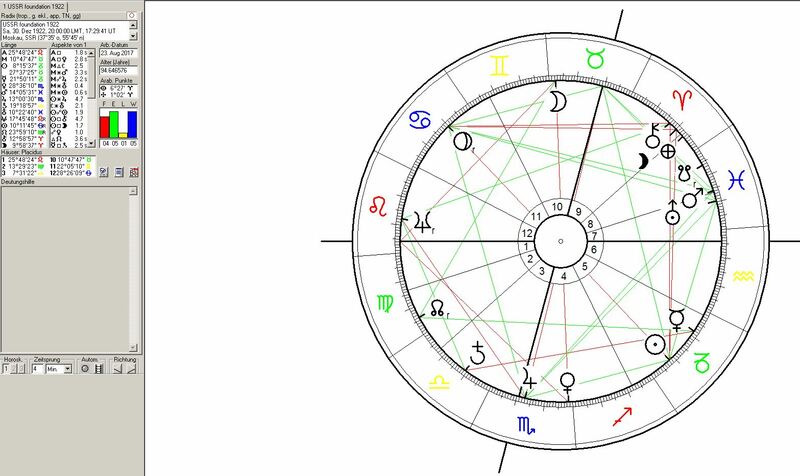 The next really important and and highly intense transit of major importance for the russian government will be Uranus` coming transit conjunct the position of the russian government at 2° Taurus. The process will be triggered from the date of the entry of Uranus into Taurus on 15 May 2018 and be effective until around April 2020. A transit conjunction indicates a harmonius and stabilizing process in regard to the topics and energetical autonomy of the place itself. The aspects that could be “stabilized” by Uranus are self-finding, self-liberation, innovation, revolution and retracing the fuller amount of the place`s own potentials. It has to be taken into account that the position of Moscow in the sign of territorial expansion resonates with the extreme size of the russian empire and the role of Russia as the largest country in the world. And particularly the first degrees of Taurus have to be understood as the part of the zodiac that stands for the reflex to enter, mark and occupy territory. My favourite example here is Hitler`s Sun at 0° Taurus. Therefore Uranus in Taurus stands for a period in which the Russian government could try to retrace it`s capacity to possess or reclaim territory and to expand its spheres of poilitical interest which had been heavily reduced during the Gorbatchev era. Furthermore Taurus represents the sign of profitability, wealth, agriculture, food growth and as the sign of the earth also an important indicator for mineral resources. Economically Uranus stands for a larger step ahead in economy and could indicate a new economical beginning and decisions to reform the country`s economical system. The last time this transit ocurred was between June 1934 and May 1936 a period which as the initial phase of Stalin`s “Great Purge” represented an extremely violent, highly problematic but economically stabilizing phase in Russian history. That was of course under completely different historical circumstances. Therefore aspects of this transit should not be misunderstood by simple transfer of the past events onto future constellations. Central issues should be a legislation to achieve a more sustainable and autonomous economical progress and less dependence from selling the natural ressources of the land. In regard to the Russian relations to the rest of Europe the grounding effect of an outer planet on the russian governments` position in Taurus could intensely strengthen the russian position, standing and influence not only in regard of territorial claims but also in regard to economical cooperation with the EU. Another plausible topic that may come up during that Uranus transit. The common market within Europe and/or the economical association of Russia with the EU which has long been prevented by the dominant military and economic role of the USA. The option for a tight politcal and economic cooperation between Russia and the USA could pave the way for intense changes in Russian society with the option for an “americanization” of the russian economy and society during the transit of Uranus over Moscow. 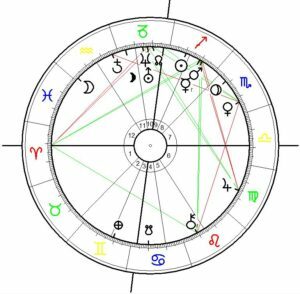 The entry of Pluto into Aquarius the sign of Uranus` rulership and in a square position to Moscow in March 2023 will activate a tight challenge and in tense questioning of the position of the russian government. The effects of Pluto`s square transit will be effective until about January 2028 when he reaches 6° Aquarius. Pluto can of course be expected to represent pressure from all kinds of belief systems and ideologies. Russia`s strategical alliance with the USA – now the worldwide center of neofascist propaganda – may be questioned or come to an end during that period. The stability of the political system created by Wladimir Putin is likely to be threatened. The changes and transformations in russian society make an update of the economical system, political culture and defense system of the country under heaviest pressure from national and global capitalist players inevitable. In astrogeography transits of Saturn stand for triggering processes and climax phases of the developments caused by the long-term developments as reflected by the transits of the outer planets. The next really tight transit of Saturn in relation to Moscow will be first triggered when Saturn changes signs from Sagittarius into Capricorn on 20 December 2017 with its first climax shortly before Saturn`s retrogracy from 17 April 2018 at 9°08` Capricorn. The effects of Saturn`s transit in opposition to Moscow will reach their climax between December 2018 with Saturn at 9° and November 2019 with Saturn at 16° Capricorn. The opposition from Capricorn is a reality check for the russian government, its personell and its more recent politics. As this transit falls in the period of the Uranus conjunction (3-2018 until 4-2020) the logic of their interaction has to be investigated. Saturn`s ingress into Aquarius on 22 March 2020 will activate extreme tension and challenge of the Russian government through a square position to the 2°Taurus astrogeographic position of Moscow effective until February 2021. Saturn in Aquarius stands for a reorientation process of the political institutions. Tsar Peter the Great made St. Petersburg the capital of Russia in 1712 thus overshadowing the role of Moscow. 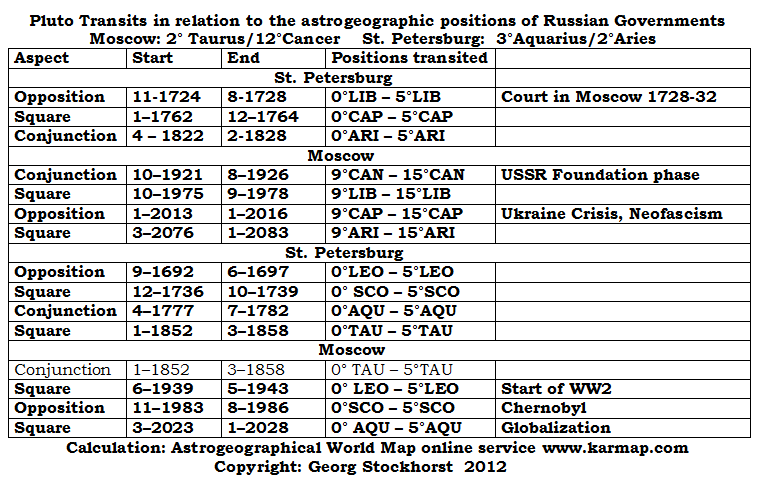 The astrogeographic positions of St. Petersburg are 3° Aquarius (an exact square to Moscow!!!) and 2° Aries for morphogenetic field level 1. 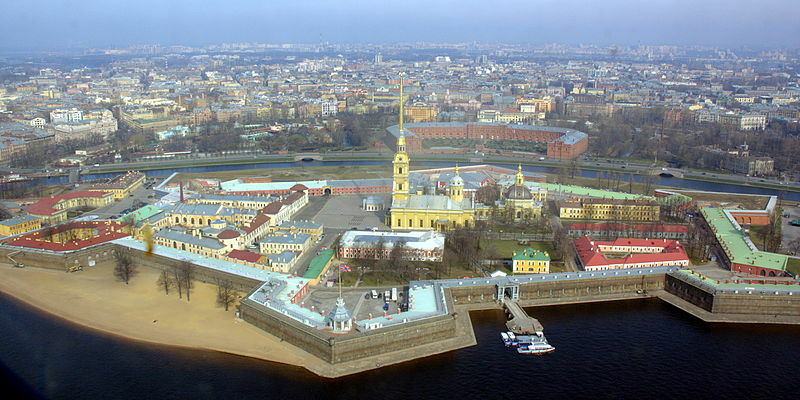 The date of the foundation of the Peter and Paul Fortress is regarded as the birthday of St. Petersburg. 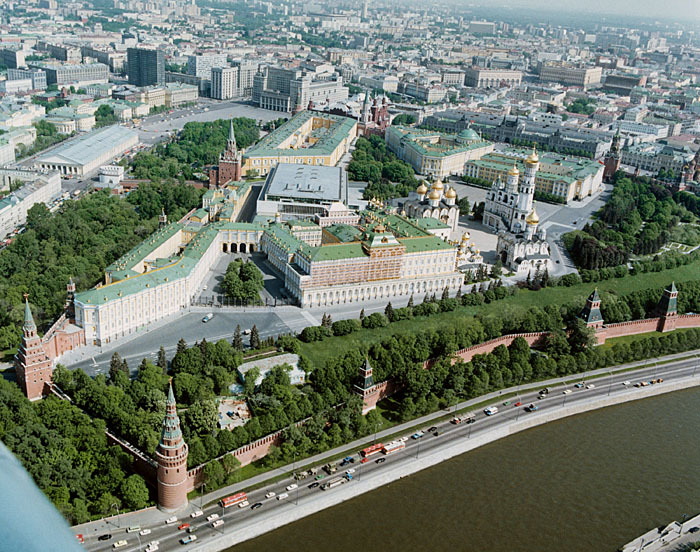 Neptune at 13° Aries was in exact square to Moscow`s astrogeographical position at 12° Cancer explaining how the dominant role of the Moscow Kremlin was overshadowed by the newly built residence. The event of the storming of the Winter Palace and the Russian Revolution is to be seen in relation with the Neptune ingress into Leo on 23 September 1914 only 8 weeks after the beginning of World War I. Neptune moved in opposition to the position of the capital St. Petersburg at 3° Aquarius and a square to Moscow at 2° Taurus. 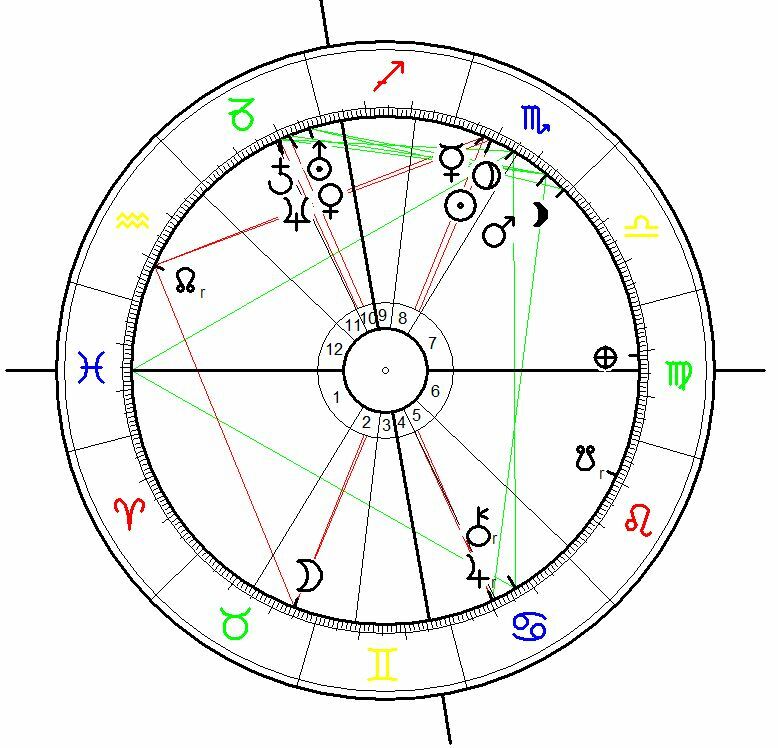 The climax phase of this tranist lasted until July 1918 when Neptune reached 6° Leo. The foundation phase of the USSR was accompanied by Pluto`s transit over the astrogeographic position of Moscow`s at 11°/12° Cancer between October 1921 (9°) and August 1926 (15°). No other planetary transit can be more symptomatic of the situation during the first 10 years of the Bolschvist Russian government. Puto is not only the indicator for the radical ideology, the fundamentalistic approach to putting it into reality and the traumatic period in all areas of life but also for the extreme pressure from enemies on under wich the government of the superlarge country (with over 20.000 km of borders) stood. 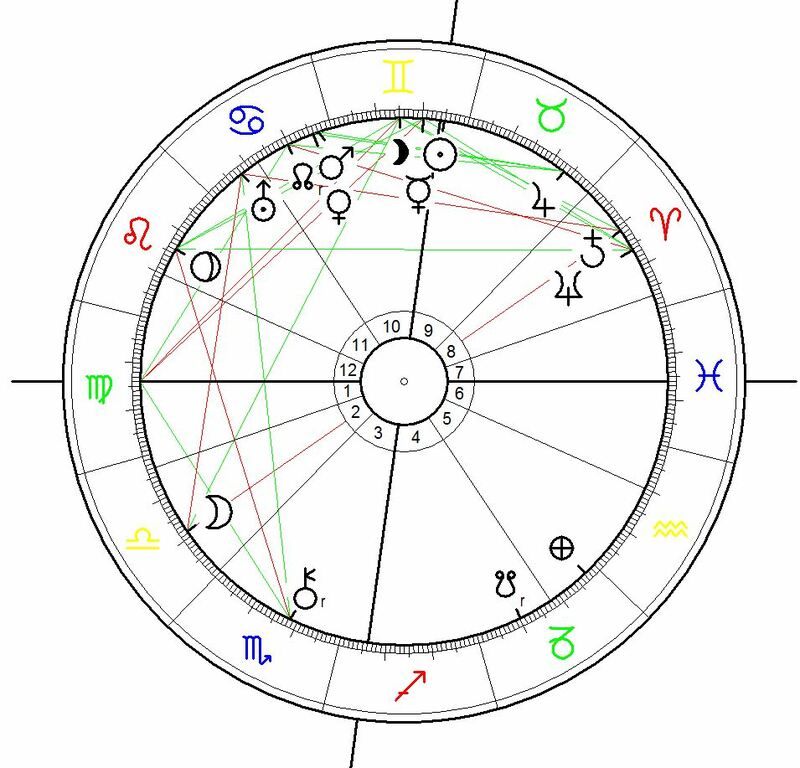 Chart for the Saturn-Neptune Conjunction on 13 Nov 1989, 14:40, Moscow. The conjunction which took place only 4 days after the Opening of the Berlin Wall was closely related to the factual dissolution of the USSR in 1991 as a result of the Perestroika process which had begun after the Chernobyl Disaster in 1986. 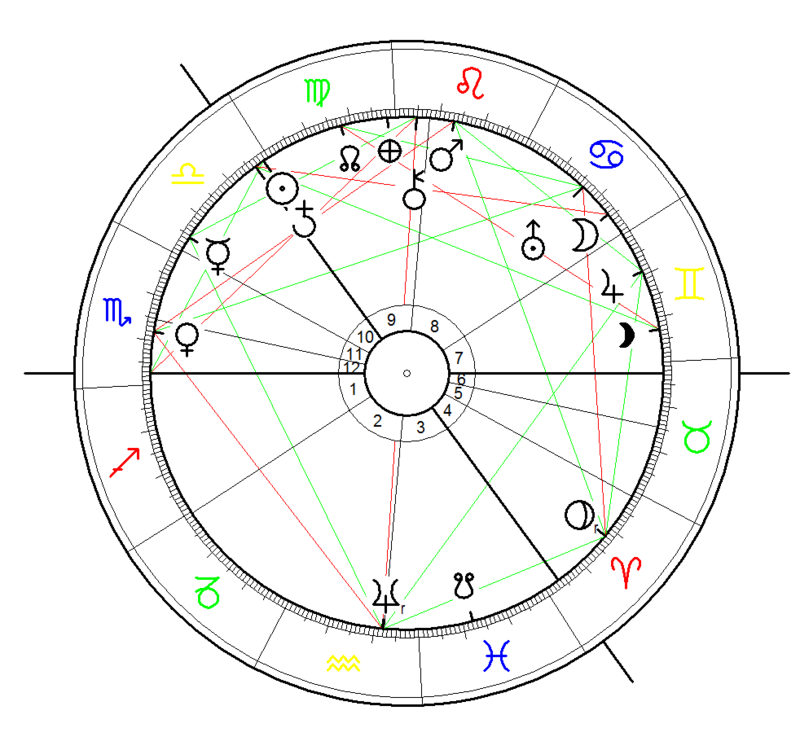 The Chart above is calculated for the Saturn-Neptune Conjunction on 13 Nov 1989, 14:40 for Moscow. The conjunction which took place only 4 days after the Opening of the Berlin Wall was closely related to the factual dissolution of the USSR in 1991 as a result of the Perestroika process which had begun after the Chernobyl Disaster (blog entry) in 1986. The conjunction at 10° Capricorn took place in close opposition to the astrogeographical coordinates of Moscow at 12° Cancer and Berlin at 10° Cancer. The conjunction of the coordinates for Moscow and Berlin both in Cancer is a perfect astrological explanation for the synchonicity and interrelation of events during the process of Perestroika and it`s consequences for Berlin. And in regard to that constellation – Neptune the planet of spirituality in itdss role as a hierarchically superior factor conjuncting Saturn the planet of hierarchies – appears to have allowed the russian government under Gorbachow to release a large number of countries from the Soviet Union without a military defeat. That surely was an unprecedented event in history!!! The close relationship of the Saturn – Neptune conjunctions during the 20th century with the history of the USSR, Communism and Germany is legendary: The Russian Revolution on 8 Nov 1917, the East Berlin Uprising on 17 Jun 1953 and the Opening of the Berlin Wall on 9 Nov 1989 mark central events close to the 3 conjunctions of these two planets. Conjunctions between Saturn and Neptune occur regularly every 36 years. The 2°Aquarius coordinate of the Chernobyl reactor site for field level 1 the supraregional, worldwide level of resonace lies in exact square to the astrogeographical position of Moscow at 2°Taurus. Aquarius relates to Uranus the triggering planet which was on the ascendant during the catastrophy. Uranus is the indicator for Uranium, the radioactive fall-out set free, the explosions within the reactor and for the political change that the disaster effected in the Soviet Union. Politically the square between Aquarius the sign of revolution and Taurus the sign of the possession, market places and financial profits. Particularly for the case of Moscow the astrogeographical position stands for the role of the Russian Capital as the center of the largest territory possessed by one capital worldwide. On the day of the declaration of Russia´s Independence from the USSR Neptune`s transit in opposition to Moscow had reached 13°45` Capricorn. This position explains that the partly dissolution of the Russia`s role as a supersuperpower was at least partly motivated by a spiritual and not economical motivation. And yes of course Neptune`s opposition to Moscow can be interpreted as a symbol for the economical decay of the USSR during that period. It is fascinating and remarkable that the soviet political system was capable of allowing such a remarkable shift. 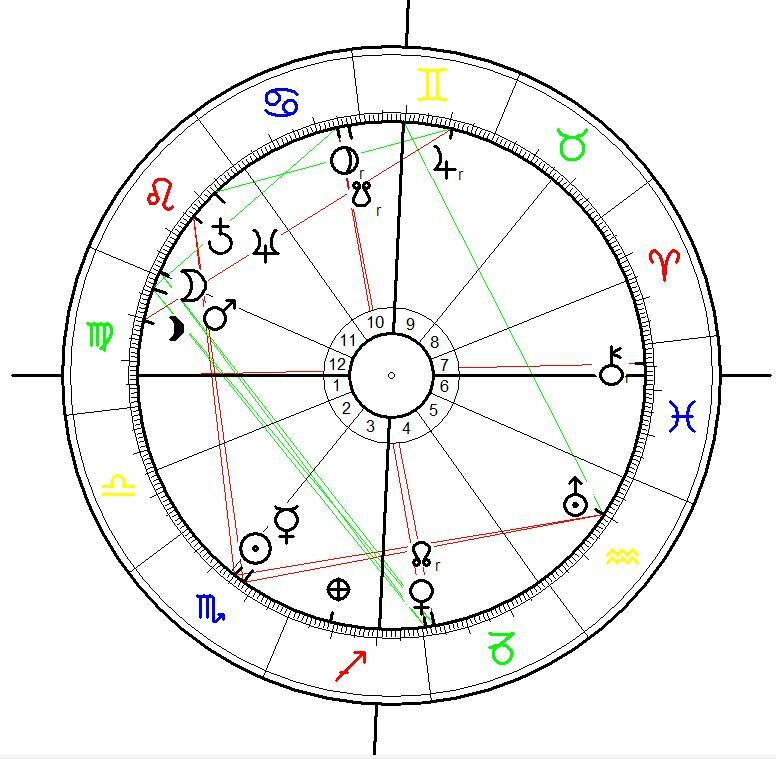 Above all the dissolution of the USSR was carried out by a President born with the Sun in Neptune´s home sign Pisces: Mikhail Gorbachev born on 2 March 1931 at 20:30. The ratification of the dissolution of the USSR by the Russian Parliament meant large territorial losses for Russia as 14 states gained territorial sovereignty. The dissolution of a world superpower without military defeat was unprecendented in world history. During the process of the ratification Saturn in Aquarius the sign of self-finding, emancipation and revolution passed a tight square to the Russian Government in Moscow`s position at 2° of earth sign Taurus the sign of agriculture and possessing territory between January 1991 (0° Aquarius) and January 1992 (7° Aquarius). In the light of this transit Taurus the sign of territorial claims clearly appears as the indicator for the gigantic dimensions of the territory of Russia and the urge to conquer and capacity to possess such vast territories. 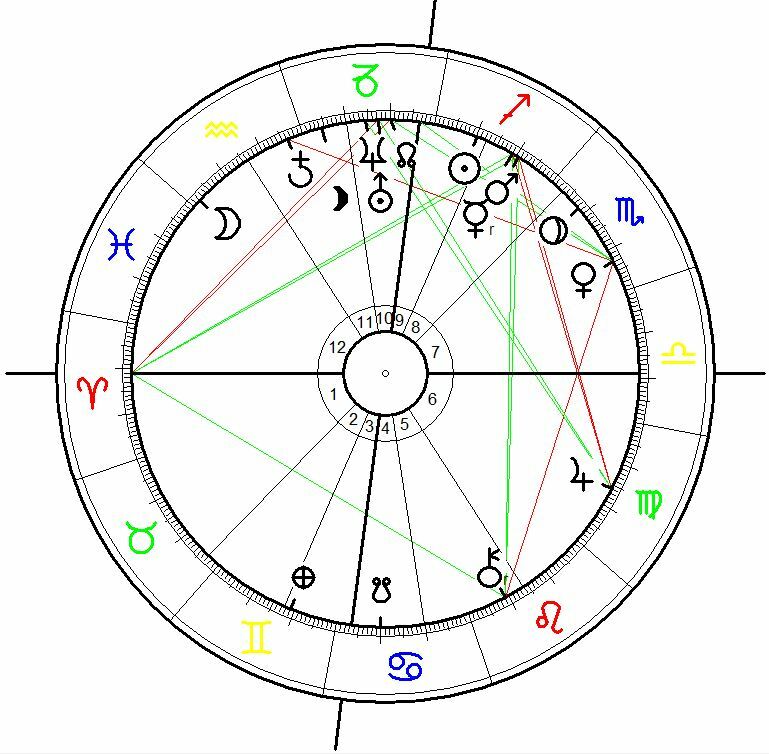 At the same time Uranus the ruling planet of Aquarius was in transit over the opposition to Moscow (12° Cancer) between April 1990 (9° Capricorn) and December 1992 (15° Capricorn) challenging the hierarchies among the countries ruling classes, politicians and administration. Riurik (c. 830 – 879) was a legendary Varangian chieftain who gained control of Ladoga in 862, built the Holmgard settlement near Novgorod, and founded the Rurik Dynasty, which ruled Kievan Rus (and later the Grand Duchy of Moscow and Tsardom of Russia) until the 17th century.